Tomatoes + feta + basil has always presented a really classic combination. By slow roasting the tomatoes one is able to extract that deep, concentrated sweet flavour. My suggestion would be to serve this salad with a slice of toasted sourdough bread or just as a spritely side dish at your summer braai. Mix the tomatoes, olive oil, salt, pepper and sugar together and roast in a pre-heated oven at 180°C for one hour. Take out of oven, sprinkle with balsamic vinegar, mix well and let it cool down. Taste for seasoning. My mom always says that we eat far too much over the festive season particularly on Christmas Day … with the roast turkey, the smoked gammon or ham, leg of lamb and every other meat variety under the sun. She actually banned the glazed gammon from the Christmas table this year …but Christmas for me without gammon is like Christmas without turkey or Father Christmas arriving without presents! So I have decided to disguise my “gammon” (I used Black Forest Ham) in a lovely fresh summer salad. In this recipe, perhaps the most important part of this salad is the dressing. You can have the most beautiful ingredients but if the dressing is dull the salad is dull. Many people just do not pay enough attention to their salad dressing and it is kind of like the angel on top of the Christmas tree. Adding the little pink peppercorns just lifts the whole dish into another dimension and just one little bite sets the Christmas bells ringing. Happy Christmas cooking! For balsamic glaze - Put all ingredients in little pot and boil for 8-10 min over medium heat. Remove from stove and allow to cool down. For goats’ cheese crostinis - Mix the goats cheese + dried cranberries + basil together. Smear the goat and cranberry spread over each of the little toasts. Carefully place 2-3 pink peppercorns onto each crostini. Summer is salad time. This is the most easiest salad but so packed with flavour because of the passion fruit dressing. I find the passion fruit lifts everything and the combination with the balsamic does wonders to the simplest salad. First preheat your oven to 200 degrees. Coat all the tomatoes in olive oil and a sprinkle of salt and bake in the oven for 30 minutes. For the salad dressing, mix all the ingredients together. Put all the salad ingredients into a bowl and drizzle liberally with the passion fruit and balsamic dressing. 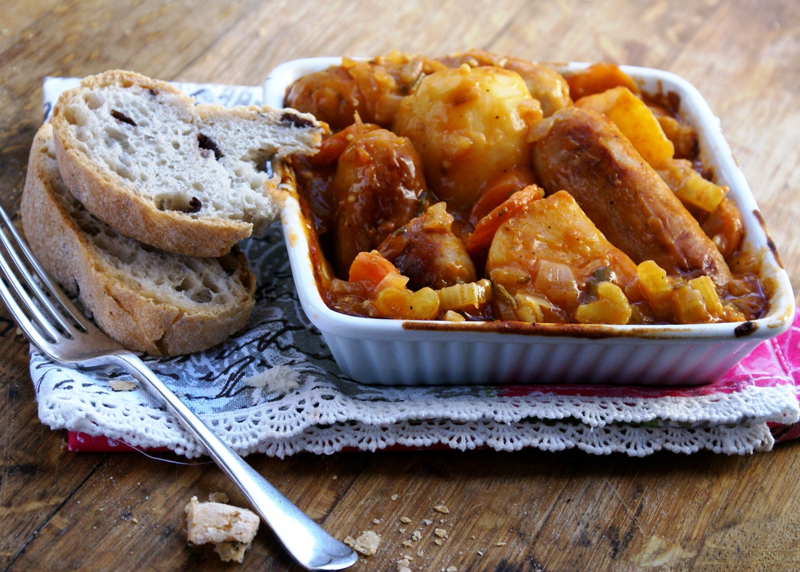 Porks sausages + bacon + beer + vegetables – my version of the Irish coddle is one of Rick’s favourite dishes. I am married to a man of Irish descent and what I have learned from our family visits to Ireland – and my husband is that the Irish love beer (Guinness only when in the Emerald Isle) + whiskey + eating potatoes + pork sausages + salmon + they only start a party at 9pm and even if you are around the ripe age of 75 there is still nothing wrong with partying till 4am and passing out on the couch at you friends house if you had too much to drink!! I just love the Irish, it is their spirit, their joviality and perhaps the fact that they are never shy to drink more than me. For this recipe I have added a few herbs, mustard seeds and some beer and then also added some lemon. I think it’s a bit of modern Coddle and it’s hearty and just perfect in the dead of winter. It is so easy to prepare …everything is in one bowl, meat, veggies etc. So between my mother-in-law and my sister-in-law I think we have come up with a rather decent local version of the Irish coddle! Sleinte! Fry the sausages in an oven proof dish with 2T olive oil. Just brown them and then remove from dish. Now fry the fry the bacon and take out. Add the other 2 T oil and fry the onions till golden brown. Add carrots and the celery and garlic sweat veggies till translucent. Add 30 g flour, let it fry for a minute or two. Put the lid on and bake for 1hour.